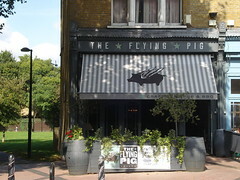 The Flying Pig was a pub in East Dulwich. It has now closed. As of late 2018 the premises are occupied by a cafe called Aneto Cafe. The interior decorator clearly went for the "distressed" look, with painted floorboards far too heavily scuffed for the pub's short lifetime so far (according to the 2015 Good Beer Guide, it opened in Summer 2013). The wooden tabletops bear purposeful-looking grooves and scratches. Old pump clips are displayed on the whitewashed brick wall at the back. There's some seating out the front, cordoned off from the pavement by a wooden fence with planters. Kake visited on a Monday lunchtime in September 2014. There were a couple of other customers in at 12:15pm. Music was playing (The Proclaimers, Michael Jackson, Rihanna), not too loud. The handpumps offered Adnams Ghost Ship, Flipside Sterling Pale, A Head In A Hat Tommy (brewed at the Florence in nearby Herne Hill), Brick Brewery Archway Steam, Rocksteady Hard Cider, and Skyborry Medium Dry Cider. There were also keg fonts for beers including several from the Camden Brewery (Hells, Witt, Pale, and Ink). A pint of lime and soda was £1. According to their website as of September 2014, food is served 11am-3pm and 5pm-10pm Mon-Fri, 11am-10pm Sat, and 11am-8pm Sun. From the lunch menu photo, Kake tried the pulled pork sandwich (£12 including chips) photo. The bun held together well, and the black sesame seeds on top were an interesting touch. There was plenty of pulled pork inside, with a nice subtle smokiness to it. The coleslaw was crisp and seemed to have been made in-house. The chips were good too (albeit pre-salted) — proper hand-cut chips, nice and crisp. According to a sign seen in September 2014, there's a quiz on Wednesdays. Child-friendliness: Under-18s are only permitted until 7pm. There's a baby change facility in the accessible toilet. Accessibility: A small step to get in (no more than 2 inches). The bar, some of the seating, and the accessible toilet are on the same level. Three steps with handrail to lower seating area; also three steps (different ones) to the other toilets. Last visited by Kake, September 2014. Last edited 2018-12-02 11:39:54 (version 7; diff). List all versions. Page last edited 2018-12-02 11:39:54 (version 7).